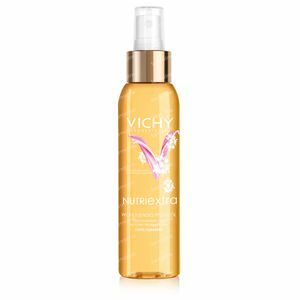 Vichy Nutriextra Body Oil 125 ml order online. A valuable combination of 9 vegetable oils, which have been selected to take care intensively of the dry and sensitive skin, and to leave it with a dry finish. A sublime skin, which feels pleasant for 24 hours, without getting greasy on the surface. The mild and sensual formula slides smoothly over the skin, which accounts for an intensive and pleasant massage-moment. The scent, which is both warm as flowery, contains the irresitable scents of Bergamot, Ylangylang and orange blossom. Your skin gets perfemed subtlely. Tested on sensitive skin. Without parabenes, silicones or preservatives. This extraordinary oil is the beauty treatment by Vichy for the skin, even for the most sensitive. For women with a dry or very dry skin, who want to combine the pleasure of a dry oil with the effectiveness of an intensive care. A bodily oil that at the same feeds the skin and makes it feel dry. 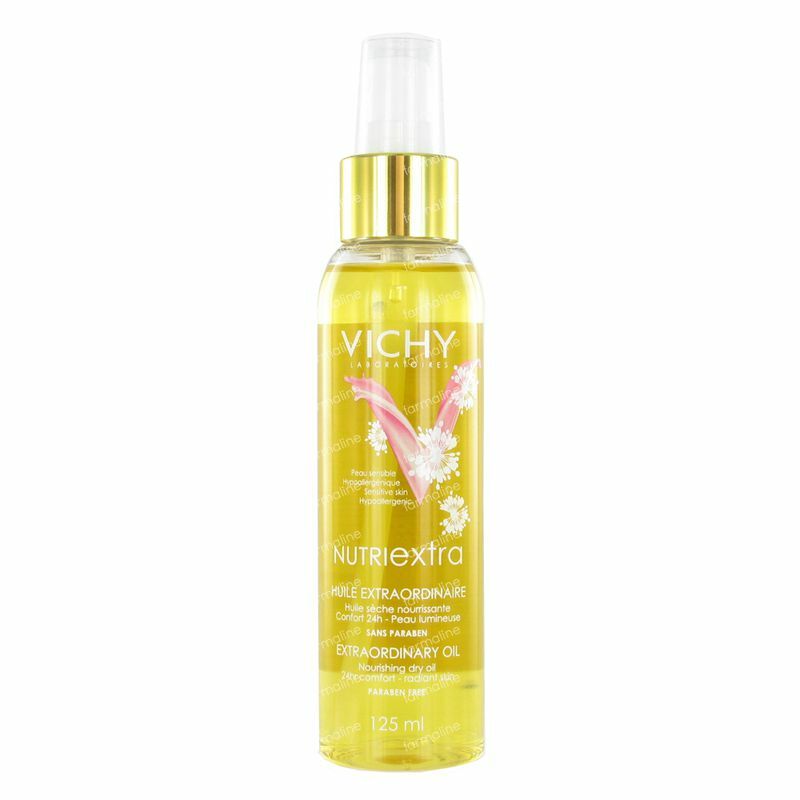 Nutriextra Extraordinary Oil may be used on the body, face and hair. For the face: Spray a small amount into the palm of your hand and apply delicately to the face, avoiding the eye contour area. For the body: Spray directly on the body or in the palm of your hands before spreading over the body. Apply to warm, still somewhat damp skin straight after a shower (absorption will be improved). For the hair: The product may be used on damp or dry hair and applied either along the entire hair length or only to the hair ends. In order to distribute oil evenly, spray product first over the hand, rub your hands together and then comb through hair with fingertips along the entire hair length, paying particular attention to the hair ends if damaged. To use it as a mask, leave it on to take effect for 10 to 15 minutes before washing hair. Caprylic/Capric triglyceride, Dicaprylyl Carbonate, Zea Mays Oil, Macadamia Ternifolia Seed Oil, Rosa Canina Fruit Oil, Coriandrum Sativum Oil, Simmondsia Chinensis Oil, Prunus Armeniaca Kernel oil, Tocopherol, Passiflora Edulis Oil, Capiscum Annuum Extract.